It does not matter how anyone sees it, Black Africa is still far from reality, it affects the region to have control over her future and compete with advanced Western countries of the world. Inability to withstand challenges within the environ compels Africa remains underdeveloped or third world continent from time immemorial with no effort to eschew from primordial conservation. No wonder, US president Donald Trump, blasted Africa as a continent that deserves to be re-colonized for another century not because of White interest on their new untapped resources in the periphery but due to the high rate of Black Africa leaders' stupidity to advance in the contemporary world politics. Africa is mentally deficient in international politics even when they are opportune in all strategic positions, they mess it up comfortably playing second fiddle, forgetting politics is a temporary game of chance for who gets what when and how. US foreign policy in Africa continent led by Trump regime should be an avenue for Africa to take advantage of. The wings of favorable international politics are hovering in Africa domain to redeem the region from servitude, internal colonialism, civil-military democracy and unrest that ravaging development within the periphery. Pathetic those in positions seem not to foreseen the game of politics probably they are intoxicated for inherit wickedness and stupidity, seeing another suffering hence they are living large in a midst of scarcity. Shamble official invitation of a notorious human rights violator Mohammadu Buhari, at Hague to deliver a speech in a hallowed chamber of ICC was a disgraceful, stupidity of century melted on Africa race. 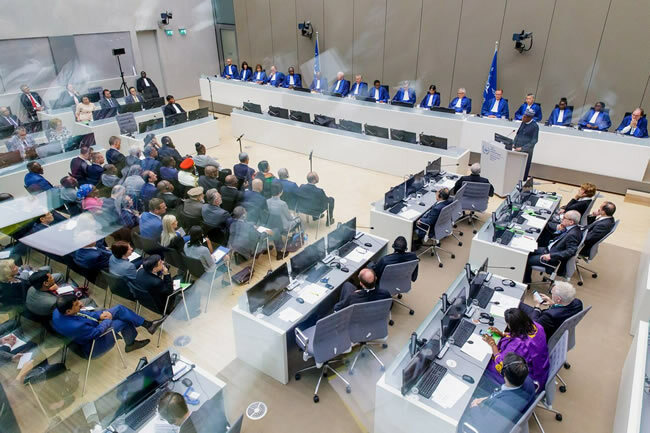 Never in history was a terrorist like Nigeria current president allowed to make a speech in ICC when Whites were in charge of the presidency and chief prosecutor of that chamber. This alone shows how mentally derail Blacks are. Emotion and corruption control their mindset to prevail yet political psychopaths praised those morons in ICC apex body. It is on record; the Republic of Argentina is the primus inter pares among the members of the Assembly of states-parties to ICC, without having any known case of crimes of grievous human rights or related to it. Argentina president Mr. Mauricio Macri was rigged out as a qualified head of state to preside over the speech, but a hallmark of corruption running in the vein of Black Africa ICC president Chile Eboe-Osuji and Chief prosecutor Madame Faton Bensonda respectively never allowed them to anticipate the risk of their actions. Without quick intervention, ICC may die a natural death at 20 following the extension of an invitation to a well-known murderer to preside over a lecture made for advocates of rule of law. It saddens my heart when Blacks complain about racism, in all indications. Black Africans are the architect of their misfortune, enough chances at their disposal to savage internal military regime in a democratic dispensation by fishing out Gestapo leaders like Buhari, the Nigeria president and his partner in crime Paul Biya of Cameroon to book of genocidal crime against humanity rather they are playing Africa prebendal politics. South Cameroonians (Ambazonia) are gruesomely slaughtered on daily basis without remorse by Biya’s led government, just because they want their voices to be heard. The mainstream of Biafra, the indigenous population are mapped out for extermination their sin is asking for a referendum to determine their coexistence with Nigeria. Many IPOB members are in various detention centers illegally. Sambo Dazuuki, former National Security Adviser and Sheikh El-Zakzaki were several occasions granted bail by competent courts of law yet; Buhari flouted the order in a so-called democracy, what a shame! Regarding hundreds of petitions filed against Buhari for human rights violation regrettably, the same monster was invited to give a lecture for those that respect rule of law. ICC my foot under Black Africa stupidity, if they must have our regard Nigeria government must openly persuade those Hitlers to respect rule of law and all those detain unjust without further delay be release with compensation. A call for referendum is not a call for war likewise, right for self-determination is enshrined in UN Charter and international law which Nigeria is signatory to, Buhari ought to face ICC discipliner panel by now for contravening the guiding principles of international law or enshrined else their existence is nothing but mirage to protect certain sets of people sponsoring them.